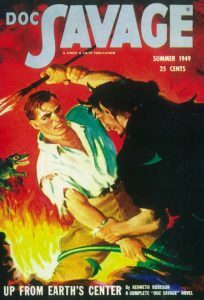 Doc Savage is one of the more popular characters in comics from the 1930s-1940s. Savage has been in radio, television, and film in addition to comics. Savage is a is a jack of all trades of sorts. He is a physician, scientist, inventor, explorer, researcher, and adventurer. Since birth, he has been highly trained with many specific skills to fight evil around the world. You could say he is more than the average human being. Black co-wrote the script with Anthony Bargarozzi and Charles Mondry with Neal H. Moritz producing. Sony’s president of production Hannah Minghella said, “We couldn’t be more excited to be building a franchise from the ground up with Shane and this team. Shane and Neal have a fantastic understanding of the character and a great take on the material and we can’t wait to get this production up and running.” I hope Black’s wit makes it on screen with Doc Savage. This could be an epic film. Can’t wait. This entry was posted on Wednesday, May 8th, 2013 at 12:12 pm	and is filed under Comics, Film, Music. You can follow any responses to this entry through the RSS 2.0 feed. You can skip to the end and leave a response. Pinging is currently not allowed. Who should get the titular role? « Check Out The Amazing New Trailer for ‘Ender’s Game’!!! [after a plan goes wrong] Oh what the hell? You gotta die of something.